Paul: Refugee program deserves more scrutiny! After reading the opening paragraphs of Paul’s op-ed in the Washington Times today, one might think Kentucky Senator Rand Paul has been reading RRW! All of the cases he cites have been reported on these pages! Fazliddin Kurbanov is from Uzbekistan, a Central Asian country that borders Afghanistan. This month, Mr. Kurbanov was arrested in Boise, Idaho, charged with teaching people how to build bombs that could be used to target public transportation. He is accused of conspiring with the Islamic Movement of Uzbekistan, which the United States recognizes as a terrorist organization. Mr. Kurbanov was here legally, admitted as a refugee in 2009. Last year, in Aurora, Colo., Jamshid Muhtorov was arrested and charged with providing material support to the Islamic Jihad Union, which the United States recognizes as a terrorist organization. Like Mr. Kurbanov, Mr. Muhtorov is from Uzbekistan and was also here legally as a refugee. In 2011, in my hometown of Bowling Green, Ky., Waad Ramadan Alwan and Mohanad Shareef Hammadi were arrested and accused of supporting efforts to kill American troops in Iraq. Both men are from Iraq. Both were also here legally as refugees. The Bowling Green Daily News reported that these Iraqi refugees “slipped through the vetting process that allowed both of them political asylum in the United States.” Apparently, Mr. Kurbanov and Mr. Muhtorov “slipped through” as well. I condemn government inefficiency and incompetence often. The targets for criticism are endless. In the repeating patterns from these refugee and visa cases, however, we see potentially dangerous scenarios in which we cannot afford any excuses. These questions are crucial as Congress continues to debate immigration reform, in which vital national security concerns must be addressed. Our visa and refugee programs deserve far more monitoring and scrutiny, and there is something desperately wrong with a “vetting process” that makes so many repeated mistakes. Instead of fixing the problems, the so-called ‘comprehensive immigration reform bill’ (S.744) weakens security measures already in place but doing poorly! Most efforts to strengthen security failed in the Senate Judiciary Committee mark-up largely due to heavy lobbying by refugee resettlement contractors who object to anything that slows the flow of refugees into the US (and slows the flow of taxpayer dollars into their coffers!). Paul concludes by laying down a marker for Harry Reid. The question then becomes is this a recommendation by Paul or a demand; and will he follow through by holding up the Gang of Eight plus Grover bill *when it reaches the Senate floor? The Politico Iowa poll story is here. *Senator Paul, if you are reading this, please stay away from Grover Norquist! I’m AnnC@refugeewatcher on twitter. Please tweet this and also follow me! Make no mistake, intimidating you so that you won’t speak negatively about Islam is what is at the root of a public meeting to be held in Tullahoma, TN this coming Tuesday. The one thing that could save us from suffering the same fate as the UK and Sweden, with their demographic death spiral due to Muslim immigration, is our Constitutionally guaranteed free speech. The Obama FBI and the Justice Department would like to shut you up! Here is the story from the Tullahoma News. Also, see Creeping Shariah which has more, here. *Update* Daniel Greenfield is on the case too, here at Frontpage magazine. A special meeting has been scheduled for the stated purpose of increasing awareness and understanding that American Muslims are not the terrorists some have made them out to be in social media and other circles. “Public Disclosure in a Diverse Society” will be held from 6:30 to 8:30 p.m. on Tuesday, June 4, at the Manchester-Coffee County Conference Center, 147 Hospitality Blvd. Special speakers for the event will be Bill Killian, U.S. attorney for the Eastern District of Tennessee, and Kenneth Moore, special agent in charge of the FBI’s Knoxville Division. Sponsor of the event is the American Muslim Advisory Council of Tennessee — a 15-member board formed two years ago when the General Assembly was considering passing legislation that would restrict those who worship Sharia Law, which is followed by Muslims. Killian and Moore will provide input on how civil rights can be violated by those who post inflammatory documents targeted at Muslims on social media. Killian said the presentation will also focus on Muslim culture and how, that although terrorist acts have been committed by some in the faith, they are no different from those in other religions. That ridiculous moral equivalence argument! And, then they have the nerve to say that Timothy McVeigh was a Christian terrorist! McVeigh never invoked any “faith” as a reason for his attack and there still remain questions about whether he in fact had Muslim helpers (Iraqi?) that were not thoroughly investigated because it is believed that wouldn’t have fit the official FBI case against McVeigh. Killian and Moore are propaganda enablers! In Tullahoma, they are also going to show that damn propaganda film, ‘Welcome to Shelbyville,’ the creation of which we documented from the very beginning. It came out of a Far Left group of ‘community organizers’ and then was legitimized by the US State Department. Here is one more of dozens of posts in which we’ve talked about that film. Shelbyville, TN was overloaded with Somali refugees lured there by Tyson Foods (my theory is that the US State Department serves as the employment service for the big meatpackers). Their arrival caused some serious community discord. Type ‘Shelbyville’ into our search function to learn more. Zak Mohyuddin, a Muslim Advisory Council member, said a shortened version of a documentary called “Welcome to Shelbyville” will also be featured. The documentary, produced by the Public Broadcasting Service [No it wasn’t!!! It was privately produced–ed], spotlights recent demographic changes in nearby Shelbyville, with a focus on the growing number of immigrants from Latin America and Somalia with many Somalis from the Bantu minority ethnic group which practices Islam. So, why are they trying to scare Tennesseans into silence on Islam? Because Tennessee has one of the most active group of citizens in the country questioning the wisdom of resettling Muslim immigrants from terror-producing countries into their towns and cities (being done largely by Catholic Charities no less!). Someone should stand outside this meeting with a sign that simply says—we still have free speech in America! Thank God! The Fridley Trail, in a quiet suburb of the Twin Cities, is an unlikely place to run across a Somali gang so say officials hoping to downplay the incident. 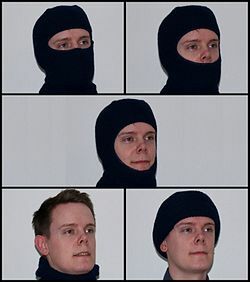 A Balaclava—the latest Muslim fashion trend, demonstrated by a non-threatening white guy. FRIDLEY, Minn. (WCCO) – In broad daylight, and within full view of a busy stretch of East River Road, a group of seven young men struck two joggers totally at random. The joggers were out for a Sunday run near East River Road and 37th Avenue North when each one was suddenly and viciously punched by the group. Lt. Mike Monsrud, of Fridley Police, says attacks like these are rare. The victims said their attackers demanded no money and said few words before striking. [What words? 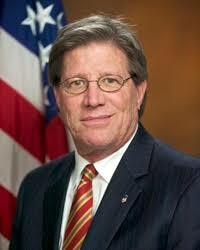 Inquiring minds want to know!—ed] The attacks, according to Monsrud, appear to be unprovoked. The jogging trail follows along the Mississippi River and connects to the nearby Anoka County Riverfront Park. That’s where Carlos Rodriguez comes to get in some exercise and play with his kids. But to Rodriguez, the safety of the park and its trails is now in question. Police say this is the first incident of this nature that’s been reported along the jogging path. Authorities said the suspects are described as a group of six to seven Somali men that were traveling together — one wearing a hooded sweatshirt and another who was wearing a balaclava around his neck. This reminds me of the 2009 story we had from Minneapolis where Somali “youths” were randomly attacking bikers and kids, here. Maybe those marauding youths have grown up and spread out to the suburbs? For new readers: We have resettled more than 100,000 Somali refugees to cities large and small in the US over the last 25 years. See one of the most widely read posts here at RRW. Large numbers went to Minneapolis, and now they are spreading out throughout the state. In three years since 9/11 ( Bush years 2004, 2005, 2006) the number of Somalis arriving topped 10,000 per year. Those refugees then began bringing in the family (chain migration!) until 2008 when shock of shocks! the State Department discovered that as many as 30,000 Somalis had lied about their kinship and weren’t related at all. The State Department then closed the “family reunification” program for Somalis. It has recently been re-opened for new and legit family members, but they have no intention of finding and deporting the liars. Fiscal year 2013 is shaping up to approach those three Bush years in the number of Somalis arriving in the US through refugee resettlement. Here is the whole story from the Denver Post yesterday (hat tip: Michael). This is a common practice in the ‘refugee’ community and a topic we have previously mentioned. Here is one post we wrote about Burmese refugees traveling to Colorado to get a drivers license. You gotta laugh! No photos of the real perps? I thought I could quickly get a mugshot of the chief scammer, but no luck. There are lots of stories on this case going back a couple of years, but no photos I could find quickly. I have to laugh, food stamp fraud stories are often illustrated with EBT cards and the only illustration I could fine for this story was this one with a driver’s license for a blond woman. Two drivers who took driving tests from the operator of a Denver driving school who faces 20 years in prison for administering examinations under false pretense were later involved in fatal crashes, according to a document in U.S. District Court in Denver. Both Tidenekiyalesh Ashenhafi W. Hawariyat, an RTD bus driver who ran a red light and struck a vehicle killing two in 2010, and Ali Aden, who ran head on into a car when he was driving the wrong way on Interstate 76 in 2009, were tested by Sikiru Fadeyi. Under questioning, Aden “revealed that he did not read, write or speak any English, it was clear that he would have been unable to pass a written examination that is only offered in English or Spanish,” according to the document. Hawariyat passed all required examinations with Fadeyi in 2006 and later upgraded to a commercial license. On Tuesday, U.S. District Judge Christine M. Arguello sentenced two others in the scheme, Djibrill Sana, and Omar Masakira, with three and two years probation respectively. “These are just minions,” Assistant U.S. Attorney Tom Mackey said. Sana and Masakira acted as “brokers” to introduce people who wanted driver’s licenses to Fadeyi. Many were from Somalia and Ethiopia. Prosecutors say Fadeyi charged applicants from $100 to $1,000 and then falsified the written and driving examination results. Fadeyi has agreed to plead guilty to mail fraud and asked for a sentence less than federal guidelines call for, saying his behavior was a “misguided attempt to aid those in the local African community,“ according a document filed by prosecutors objecting to his motion. “Defendant Fadeyi was misguided by putting on the streets and highways of Colorado, and other states, drivers who were unqualified. The defendant was misguided by not assisting disadvantaged African immigrants legitimately to pass written and driving tests. Defendant Fadeyi was misguided by putting the safety and well-being of legitimate Colorado and United States citizens and their family members in jeopardy,” according to the document. Federal prosecutor say 1,458 driver’s licenses tied to Fadeyi have been revoked. Doesn’t it make you wonder how many of those phony driver’s licenses were used for Voter Registration? This is an update of the strange story out of Florida where the “friend” of Boston Bombing suspect, and a fellow asylee, Ibragim Todashev, was shot during an investigation involving the FBI which was looking into the unsolved murder of three Jewish young men in Boston. Our original reporting on the phony Chechen political “refugee” is here (two previous posts). Here is the Washington Post update. The Council on American Islamic Relations is looking to the notoriously biased Civil Rights Division, that would be CAIR’s friend’s shop (Thomas Perez) to do a separate investigation. Perez loves the Muslim Brotherhood too! Can we also have a Justice Department investigation on how Todashev, and others like him! were granted asylum? This is going to get interesting…. 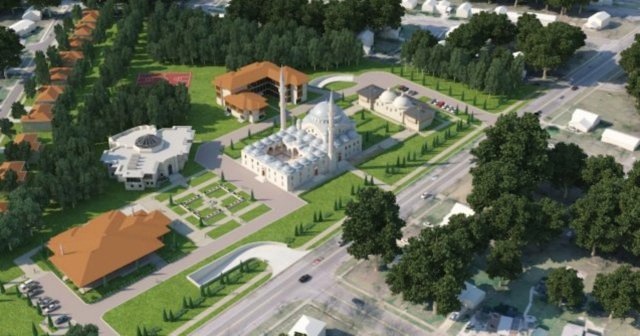 Artists drawing of Turkish Islamic Center in a suburban Maryland community, but the construction is well underway as we learned from a fellow Marylander who has been to the site to film it. Update June 7th: MD mosque to be Ottoman embassy says Walid Shoebat, here. The Maryland mega-mosque is meant to be a territorial marker, showing Islam’s increasing power over America, just like the proposed Ground Zero Mosque in Manhattan. Every Muslim immigrant is a potential warrior for jihad, like the Tsarnaev Boston bombers, who appeared assimilated, but only superficially. America should learn from the European disaster and stop diverse Muslim immigration before it’s too late. Governor Martin O’Malley “welcomed” the Turkish government’s project. Where will the Muslims who will use this facility be coming from?—immigration (Pew says 100,000 a year are entering the US) and high birthrates among Muslims. Be sure to learn about al-Hijra-–the Islamic Doctrine of Immigration, here. After yesterday, one of the best days ever at RRW with over 6,000 visitors (nearly 10,000 in three days) from around the world to our post about Swedes fighting back against the immigrant gangs in Stockholm, here, I thought I should look around to see if the mainstream media was mentioning any of this. There isn’t much in the American press. Has anyone seen any mention of Swedish immigrant riots on Fox News? However, a couple of days ago the New York Times was scratching its proverbial head to try to figure out why the immigrants to the “welcoming” social welfare capital of the world were so “unhappy.” The article was laughable as it wondered about how “welcoming” Sweden could have gone wrong—must be racism, must be the recent cut in welfare, must be a shortage of jobs, racism of course—but one word was completely missing from the piece (two actually). The ‘I’ word and ‘M’ word could not be found. Like “Voldemort” in Harry Potter, “Islam” and “Muslim” are words never to be spoken in stories like this one. Like the evil character in Harry Potter (He-Who-Must-Not-Be-Named) aka Lord Voldemort, Islam Must-Not-Be-Named! STOCKHOLM — Eva Bromster, an elementary school principal, was jolted awake by a telephone call late Thursday night. “Your school is burning,” her boss, the director of the local education department, told her. Ms. Bromster rushed to the school, in the mostly immigrant district of Tensta, north of Stockholm, and found one room gutted by fire and another filled with ankle-deep water after firefighters had doused the flames. It was the second fire at the school in three days. In Stockholm and other towns and cities last week, bands made up mostly of young immigrants set buildings and cars ablaze in a spasm of destructive rage rarely seen in a country proud of its normally tranquil, law-abiding ways. Perhaps readers of the NYT are expected to know their world history and geography and know without being told that if the immigrants are from Somalia, Iraq and Syria, most will be Muslims! The riots, now subsiding, have produced less damage than the earlier ones in Paris and London, which also involved mostly immigrants. But the unrest has shaken Sweden, which has a reputation for welcoming immigrants and asylum seekers, including those fleeing violence in countries like Iraq, Somalia and Syria, and regularly ranks in surveys as one of the world’s happiest places. Gee, it can’t all be about poverty, they have a world-famous welfare system in Sweden. The Left cannot let go of the idea they have pushed for decades that Islamic Jihad is related to poverty. If not poverty it must be racism. While the violence was concentrated in relatively poor districts, most of their residents have been shielded from dire poverty by a welfare system that is one of the world’s most expansive, despite recent cutbacks. The left, which dominated Swedish politics for decades and devised the cradle-to-grave welfare system, has blamed reduced state benefits and a modest shift toward the privatization of public services for the unrest, pointing to an erosion of the country’s tolerant, egalitarian ethos. The recent violence has been a boon to the Swedish Democrats, the anti-immigration party. Opinion polls suggest the party is gaining in popularity, partly because of the indignation many Swedes feel about being called racists after accepting so many refugees. Immigrants and the Swedish-born children of immigrants make up about 15 percent of the population, and last year Sweden nearly doubled the number of asylum seekers it took in and became Europe’s primary destination for refugees from Syria. And, one more thing, the NYT had the audacity to suggest it was older immigrants, no mention of the Swedes, who went out on the streets to try to get the “youths” to go home.